I found this recipe in Every Day with Rachel Ray magazine. Her recipes are quick and easy. I forgot to use the raisins when I prepared, but it was still really good. In a saucepan, heat 1 Tb olive oil over medium heat. Add half of the garlic and the couscous and cook, stirring, for 3 minutes. Add the broth; bring to a boil. Cover, lower the heat and simmer until the broth has been absorbed, about 10 minutes. Stir in the raisins, season with salt. Meanwhile, in a skillet, heat the remaining 1 Tb olive oil over medium heat. Add the remaining garlic and the swiss chard stems and cook, stirring occasionally, for 5 minutes. Add the swiss chard leaves, chickpeas, and ½ cup water, cover and cook, until the chard is wilted (2-3 min); season with salt and pepper. 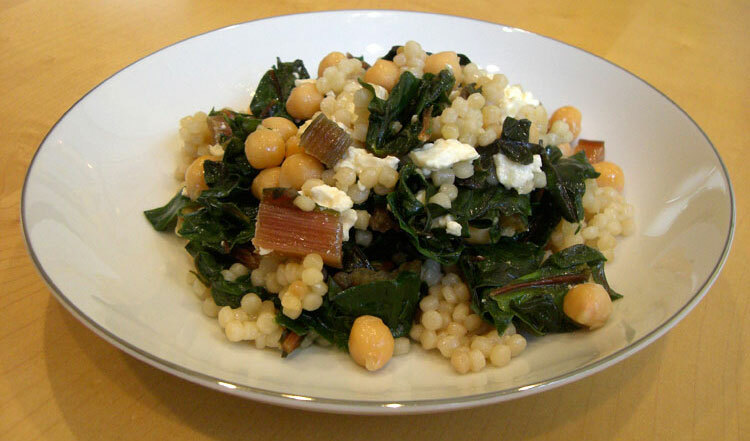 Serve on the couscous and top with feta.